One of the most versatile rims in Velocity's lineup. If you’re looking for a racing or training rim, this is the one for you. It’s stiff for sprinting and light for climbing. 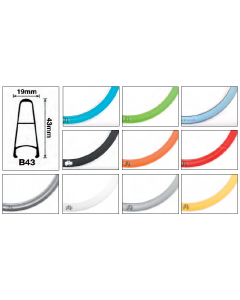 At 43mm deep, triple walled, and in drillings up to a 48h, the B43 is the ultimate rim for fixed freestyle and bike polo. If you’re looking for stiffness, rigidity, strength, and the bling that goes with it, roll these on your whip.